This story is one that I hope it won’t be hard to tell. I’m looking at it as a positive thing right now. Or detached. Or minute to minute. I’m trying not to think about the overall impact, the meta-version of this story. Because that would be too much. It was a warm, rainy May morning. The kids and I were hanging out at home. My youngest was still a newborn, so I spent much of time sitting on the couch, nursing. I put the baby in his swing and headed down to the basement. Indeed, there was water. It wasn’t deep and it didn’t cover the whole basement, but it was soaking a piece of carpet we’d put down there a few years earlier, plus some of the fabric I’d stored down there. It was enough to concern me. I called my husband at work to let him know about this. He cut his day short and came home after lunch to assess the damage. Ultimately, we decided that there wasn’t enough water to be an issue, and did nothing about it. We figured that it would go into the drains in the basement floor and that the carpet would dry in a day or so. There was no pad under it, so it shouldn’t take long. My dad swore when he came to visit the next time that the basement smelled “mustier” than he remembered before. I quietly wondered if he was right, but dismissed it. Basements just smell that way…and there’s nothing wrong with it. Things seemed to be okay for the rest of the year. But early the next year (2014), we started to get sick. We’d all had a brief, minor stomach virus around Christmas, but that was the only time we’d been sick in six months. Until mid-February. It started with a bad cold. When that cleared up, norovirus hit the family and stayed for two weeks, hitting the littlest one twice. And then, I ended up with every respiratory infection known to man, back to back to back. My throat was sore for weeks at a time, my glands swollen, I had fevers, I was exhausted, congested, coughing. The kids thankfully didn’t have most of this, but I was miserable. It was finally suggested to me (by our chiropractor) that maybe, just maybe, mold was causing all these illnesses. I was advised to open the windows and air out the house. We had had our heat or our a/c on continuously for months. I shut it off that very weekend, to stop the stale air from circulating, and opened the windows with box fans in them. Within days, I began to feel more clear-headed and less stuffy, and respiratory infections became less frequent. When we were out of town for almost a week in July, everyone improved. The kids’ energy levels rose, and they stopped complaining of daily headaches, stomachaches, and more. Even though they were eating more sugar than I’d like (they were staying with grandparents), they were better. Within a week after returning home, the complaints began to creep in again. I had a jar of magnesium lotion that had been sitting, open, on my nightstand for months. I was using it every night but I wasn’t sleeping well at all. I tried using more, and I slept worse. This made no sense! I stopped using it for a few days and my sleep improved some. Then one night, in the middle of the night (after decent sleep for me, and poor sleep for a child) I touched the lotion in hopes that magnesium would help the child rest better. I only got a tiny bit on my hands and went back to bed. Within minutes, I was congested, junk was draining down my throat, I began to cough, and I slept extremely fitfully and woke up exhausted. It was then I connected it: dust, containing mold spores, had contaminated my lotion — and I’d been rubbing that on my skin! I immediately threw the lotion out and made a new batch, which solved that problem. The kids continued to show low appetites, low energy, irritability, and complain of headaches and stomachaches fairly often. (At least one child each week.) The younger two began to get fevers or have vomiting episodes about once a month. The youngest, especially (now 17 months) began to develop food allergies, especially to grains. Any grains cause immediate diarrhea and sometimes vomiting. This was not normal. I knew it was not, but I could not convince anyone that it was serious. Yet. We decided that we would clean the basement out, and remove the carpet, and then call professionals to assess the damage before deciding what we would do. I headed down to the basement, wearing a mask dotted with Thieves essential oil and gloves. I began to clean up the area where I knew the mold would be. I found a pile of fabric — perhaps 5 – 6 yards, folded, about 30 to 40 layers thick. It was filled with mold. Every last bit of that fabric was covered in black mold. The bottom piece of fabric was filthy, brown, and spotted black, its pattern almost obscured by the amount of mold on it. All of it went into a trash bag. Beneath that, there was a giant black spot (perhaps 20″ across) of black mold. Now I knew there was a problem. A big one. The plan was to throw everything in the basement away. I wanted to call a professional, but my husband chose to do it himself. He wore goggles, gloves, and a respirator mask for the job. So did my dad, who helped. We set up a diffuser with Thieves oil in it (which can help kill mold) and an air purifier with HEPA. I thought that this would be enough to make it okay. They rented a truck, and they carried all of the papers, fabric, and other trash out of the basement. And then the carpet, too. Surely the mold was gone now? After my own time cleaning the basement, I felt sick for a week. I was exhausted, brain foggy, and could not eat. Any time I tried to eat, I would feel nausea, bloated, and have to go to the bathroom immediately. I was weak. I spent most of the time lying down, drinking water and fresh fruit smoothies, which cleared up the symptoms after a few days. The “big” basement cleaning came a week later, just as I was finally feeling better. With the air purifier down there, we assumed that within a day or two, things would be better. Our laundry was down there, so we had to go sometimes. My husband got a headache immediately when he went down to do the laundry. All of the laundry that came out of the basement smelled musty, even though it had not sat out at all. It went straight from the dryer upstairs. The musty smell came up through the floor and into our living room so that half of the room smelled musty. Any blankets or clothing that sat on that carpet picked up the musty smell, too. One of my children cuddled with a musty-smelling blanket for a few hours one afternoon and threw up that night. My congestion came back. Some of the kids complained of headaches and stomachaches. Everyone’s appetites dropped. I started begging my husband — we have to get out. Look what it’s doing to us. He went to see his alternative doctor on Tuesday, who muscle tested him and found mold in his body — and that this was the primary “issue” that his body needed to deal with. At that point, he realized how serious this was. We all had mold in our bodies, and our brain fog, fatigue, lack of appetite, anxiety, depression, and various other symptoms would not go away until we were no longer being exposed. A walk through of the house showed large, brown “water spots” in the ceiling in multiple places — that were larger than some minor water damage we’d had years earlier, or in places where damage hadn’t occurred. The shower had black mold and mildew (which we haven’t used in a year or more). The kitchen sink had leaked at one point, and there was mold under there. There was an area of the wall near the back door that had holes in it. The windows had leaked and water had run down the walls and into the carpet. Even the dishwasher had leaked. And when it did, it had come from the pipes behind it, and had run along the sub-floor and pooled in the carpet in the playroom. We attempted to clean it up with a shop vac and a fan, but it took us two days to realize where the water was even coming from (we assumed the kids had spilled something initially). That large area of the carpet, perhaps two or three feet in diameter, despite our attempts to clean and dry it, is black and discolored. We realized that the mold was in enough places in the house and that the spores — mycotoxins — had permeated every area of the house. Even if we tried remediation, there would be no way to make the house truly safe to live in again. We had to go. And we had to take almost nothing with us. This is where we are now. Making plans for “what next.” Getting the mold assessed so we know if there’s a tiny chance of getting the house remediated, or if we’ll need to sell it to a development company who will completely rehab and remodel the house. We won’t know for a few more days what that situation is. From the people we’ve talked to who have gone through this, we know that this is one of the more serious situations. But we don’t know how serious. We’ll be losing everything that is in the basement still. All the food that I canned last year. All of the blankets, clothes we saved, mementos we kept. All of it. It is likely we will lose all our other clothing too. The heirloom, hand-sewn blankets and quilts that haven’t been in the basement, we will try washing in vinegar or having professionally cleaned so that we don’t lose those too. But we might. The glass jars and other non-porous items, we’ll spray with vinegar and Thieves, or boil in vinegar water to try to save. All porous surfaces? Those are gone. All our beds. Our couches. Our books, likely. Everything. I’m trying to see the positive in this situation. We wanted to move anyway. Not quite like this, but we have wanted to for awhile. Finally, we’re making it a priority and we’re moving forward. We held off on buying a lot of things we needed or wanted, like a new toaster or a new, bigger bed. Now we will get to buy those things, and not feel like we’ve wasted anything or lost too much. We kind of needed to buy those things anyway, and had kind of planned for them in the next several months. We get to choose new items together. We didn’t pick this house (my husband bought it was he was 19, before we met). A lot of our other items were hand-me-downs that we took from anyone who would give them when we were poor newlyweds. We will now get to choose new items together, intentionally. We wanted to pare down our possessions and keep only those which are truly necessary. We wanted to live with less clutter. Now, we are starting over and will have items we choose very intentionally. No more clutter. No more waste. Our kids are excited. They want us to get a small, two-bedroom apartment with a pool and a playground. They want to share a bedroom all together and have a chance to swim and play nearly every day. That’s all they want. They think this is fun, and do not see it as a loss at all. What remains is, what next? How will we heal from the mold exposure? And where will we go? Have you faced toxic mold? So sorry your family is going through this. We are going through the same thing. Didn’t even realize there was such a hidden highly toxic substance that could make us so sick. I’ve been sick for nearly 2 years straight (since moving in) and my 9 yr old, who normally was never ever sick has been sick more recently within the past 9 months or so. Wishing you the best and healing for you and your family! Wow, I’m so sorry you are going through this 🙁 Were you using a dehumidifier after you had the flooding by chance? We have one running in the summer months to prevent the mustiness of humidity. I think every basement should have one running though. Mold is so scary. Prayers that starting over will be a blessing in disguise for your family. I never comment but I wanted to thank you for this article. We have been sick for a while just like you described so I asked my husband to check out our crawl space and he found a crack in the foundation and mold. So thank you for helping us find the cause. I am so sorry you will lose so much. Oh Kate! I am so sorry you have to go through this – and I’m happy you’ve seen the silver lining. My family also dealt with mold, and yes, it is THAT serious. My dad nearly died from the exposure. It took more than a year for them to find the problem, and by that time there were more than 30 types of mold covering hidden places in the house. It was in the walls, the ceiling, attic, under the house … everywhere. They lost their beds but were able to save some of the furniture and mementos with careful cleaning and lots of time in the sun. Still, so much had to be thrown out. It took over a year for the mold to be fully remediated and the house deemed safe for habitation. It’s been 5+ years since the exposure and in that time my father has developed asthma and has continually battled respiratory issues. I believe it’s long-term effects of the mold exposure. Most people don’t understand the severity of mold exposure – some even asked my mom, “Why can’t you just Clorox it away?” I am so glad you followed your instincts until you uncovered the issue! Your family will be much healthier and happier, and you’ll be able to get the word out about an important health issue that so many don’t understand! I am suspecting this problem in our home and have visibly seen some signs of mold. However, we are not in a financial situation to buy all new or move from our home and I am at a loss of what to do 🙁 We have no savings and a mortgage on our home due to my health issues. Where do you recommend starting? I would recommend trying a home testing kit that checks dust samples. That will tell you if there is mold, and what strains you are looking at. From there you will know how to proceed — what can be saved, what to do next, etc. I’ll post more about the testing process and how to handle everything in a couple weeks after we have gone through more of it. Where do you get a kit to test? Oh my, I can’t imagine how stressful this must be. What even makes a mold problem start? I never knew it could be so dangerous and literally permeate everything in your house. Is there a way to prevent it or check for it before it gets out of hand? I feel like I should have my house checked. I will be praying for you and your family. Mold needs moisture to grow, so the usual household situations you would encounter are a damp basement or flooding, or leaky pipes in between walls. If it smells musty that means mold. I use a dehumidifier in our half basement and never smell must. Im so so sorry for you! I hope you all feel better and get to keep those things that mean the most! I totally understand the children when it comes to the pool:-) wish you all the best and look forward to hear how its all working out for you!! I am so, so sorry. I admire your attitude in handling this challenge. I moved to Ohio in 2001.and stayed in a rented house with my son and his family. At first I stayed upstairs. but soon my son asked if I could set up my space in the basement to keep his oldest IN the house. I never thought it would be anything dangerous about it. After a few weeks of very wet weather I noticed a very musty smell coming from a storage area at the front of the basement under the front porch. I had my son unlock it. It was being used for all their Christmas stuff and other totes of goodies. The smell was so strong. We had to close the door and run upstairs and call the Landlord. He had no problems with the house before. Well that wasn’t good enough for us. I called in someone who advertised remediation for mold. the Kids were sent to live with other family. And The house turned into a scene from ET. Plastic everywhere from back door to basement. everything came out of the basement. EVERYTHING. We were told the house was a mold spore filled danger zone and to Move. We had just rented. And the Landlord would not let us out of our lease. so we paid for a cleaning and gut of all our stuff. it was a nightmare. I never had Asthma till then. But never told that it was the mold and I could be filled with it. God forbid. I moved back to California. And live with the windows open almost year round. Never will live in a damp rainy area again. I can totally relate. This happenned to us 8 years ago. For us it was aspergillus. My oldest daughter was very sick and we found the mold in her bedroom closet. It took only a week before we started seeing it everywhere. We left then and there and also lost almost everything. We never could find the cause and the insurance company would not cover it without causation. It was devasatating, but we are so thankful we got out when we did for the sake of our health. I pray you and your family have better days ahead. Thank you very much for sharing. I have not had mold experiences but i will be keen with my environment from now hence forth. God provide for all that you need to have your new home. You have to understand that as far as titles go, if I’d written “We had a mold problem” almost no one would have read it. It’s a sad reality that I’m competing with thousands of other blogs for traffic and good, eye-catching post titles (on any post, not just this one) will get clicks; bad ones won’t. It’s business. And you know — sometimes it does *feel* like we’ve lost everything, because it’s a tough situation, even though we haven’t. I don’t think that criticizing the title is very helpful. I think the title is perfect. I will admit I would not have clicked on it if it just said something about mold. We had a similar situation where our basement flooded with sewage twice and we lost 70% of our clothes, blankets, sheets, and other belongings. At the time I was pregnant and my husband and I had part time jobs. We had no money to get new clothes and bedding. 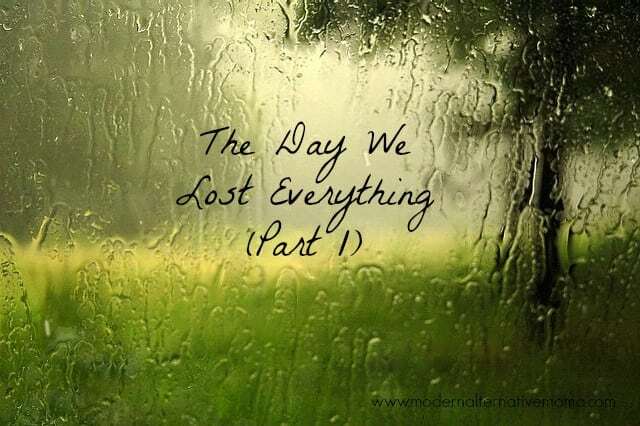 I cant imagine what it would be like to have to buy all new furniture and beds too and then with children on top of that… So yeah.. “The day we lost everything” seems perfect to me. I think it’s a good title too…. not just eye catching but really, esp as you look at what you have to leave, oh my, so hard. It does kinda feel like “everything” though like you ended with, a good attitude and perspective are wonderful and I love that. The title is just fine, Kate. Sadly we are more unsympathetic than we realize sometimes. Blessings to you and your family. Thank you for sharing your story, your heartache, and the positive outlook that your family has. Lia, I wonder why you think having a title that peaks curiosity is something to be ashamed of. Of course Kate is looking for page hits. Why write a blog is you don’t want as many people to read it as possible. Your stance just doesn’t make sense. Now I have that off my chest, I’m living with this same scenario. I feel for you and I’m glad you are looking at the positives. And another positive is to regain your health. I hope you are seeing a naturopath or dietary therapist because it’s possible to eliminate mould from the body. Lia, your comment is ignorant and insensitive. Disguising it in sympathy is even more insulting. Why criticize someone going through this? Title is perfect. And until someone has gone through it they can’t understand that it’s like having a fire that destroys everything plus having to rebuild your health and your life at the same time. We’re just starting this journey and are devastated. Yes, just stuff — but it’s overwhelming. The post title is a bit dramatic – at least you admitted then that you didn’t lose everything as you all got out safely. Hopefully things weren’t as far along as like what happened to Andrea Fabry. Aren’t in aware of her story? After I read her entire blog documenting their experience, start to finish, I vowed to take any water seriously. I can’t believe you wouldn’t have thrown out the wet fabric. And that you’d think essential oils on a face mask would do anything at all! Is this what you would say to a friend in real life if they faced this situation? If not, consider if it’s something you should have said here. And yes, I am familiar with Andrea Fabry. The title of your story is *exactly* how I felt when our family went through a major toxic mold exposure 2 years ago. We lived in a church parsonage for 8 years that was poisoning us and we didn’t realize it. We are still working to recover the damage done to our health. I know Andrea Fabry. Without her blog, I wouldn’t have had a clue what to do. She is a gift. Your family’s story has been an encouragement to me, and no doubt it will help countless others. It can save lives! Thank you so much for sharing. Like only death is dramatic…?I think the title suits the story. It IS dramatic to have to buy everything or ALMOST everyting new and to HAVE to move because of health-issues. Wishing you good luck. Chin up and thumbs up! Kate, I am so sorry. Do you need some stuff? I have tons of clothes from my younger son – all the way to age 4. Could you use some? I also have some toys – I’ll be happy to send some if you could use it. Feel free to reply directly to me. Sending my warmest hug to you and yours!! So sorry to hear about this. My parents went through this a few years ago. My step mom was sick for so long before they figured it out. They were living in the house she was born in and ended up tearing it down and building a new one. I hope you don’t have to go that far. As for loss of possessions, I can totally relate. Our house burned down to the ground in April while we were out of town on spring break. We lost everything we didn’t have with us on vacation. The sentimental stuff is the hardest. We are rebuilding the house now (thank goodness for insurance) and hope to be in in October. I will miss some things, but like you said it is kinda nice to have a fresh start. I call it the ultimate decluttering. Hope the cleanup goes well. Wow, that must have been a very hard situation, i pray all your health improves very quickly. Please ignore the ‘unhelpful’ comments – its not personal – their issues – even if t feels like it. You have a great attitude and you will look back and thank God. So sorry that you have had to go through this. God bless you for making the best of it, for seeing it as an opportunity and a ‘gift.’ Praying for you and your family. Thank you for sharing your experience, it is very helpful. About the title…I imagined possessions when I read the title and not a death. I imagined exactly what was described. I didn’t feel tricked at all. Of course the title was dramatic, it is a dramatic experience. A life-changer. Might it end up being one of the ‘best’ things to ever happen to you? Sure, maybe. But you’ve still got to get through it. I’m sorry that you’re dealing with all of this, and I’m sorry that there are people who apparently have nothing better to do than to criticize you. SMH. Geez people. This is absolutely terrible to read about. I’m genuinely sorry you’re family is going through this. I truly hope everyone gets fully well again…and soon, with no letting effects!! On the other hand, it certainly sounds like sine really great things may come of this, though I’m sure they’ll be extremely difficult coming. This experience beings up sine fear abd anxiety I have about having a place of our own, yet I know we can only do our best to keep these things from happening. Betsy and others with mold exposure who are still ill – Please go to http://www.survivingmold.com and look for a certified physician (or have your Dr. run the specific blood tests) if you are still sick. I am not soliciting at all nor gain anything from taking the time to post this, but come from a place of compassion for others who cannot detox from mold toxin exposure. I have a genetic haplotype that does not allow an antibody creation from the antigen (toxins like mold, lyme, cyanobacteria/algae blooms in water supply/lakes, etc.) and knowing that you are part of the 25% of our population who do not rebound after toxic mold exposure is so important. You can have your HLA-DR bloodwork ran along with other labs to see if the toxin has created an innate immune response (inflammation continues to recirculate in body). I have been treated for both Lyme/mold and we are remediating our home. It is a long and difficult journey to fully regain health. Believe me, even a small amount of mold for those highly sensitized can drastically change one’s life. This is a serious health issue and I’m grateful for the author sharing her story. People are not aware that water-damaged buildings can cause the health issues that they do (a long list). Cutting out drywall material/cabinetry, etc. is imperative along with finding water sources/leaks and repairing. HVAC cross-contamination is another huge issue – impacted me severely, so the system/ducting must be cleaned thoroughly using correct products approved by EPA. Cross-contamination is a huge issue but so is using the correct products (not bleach or vinegar) to clean walls/ceilings/contents that are non-porous. Losing everything like you mentioned is something I totally understand – it is a spiritual term really – you lose everything that the world sees as material and you gain life, real life and priorities – real truth. For those who have not walked this road, compassion and offering your help is the best thing you can do. God bless you and your family on your journey! I am so sorry to hear about your story! You mentioned a lot of the issues from this mold situation and it sounds devastating. I am so happy that your family can now begin the process of physical healing. I cannot even begin to imagine the financial strain this must put on your family! You may have already done this, but you should definitely call your homeowners’ insurance company. Some policies cover mold and some don’t, but it’s worth talking with them. Even if it’s just a little coverage, every little bit helps!!! Praying for you! Kate, I am so sorry to hear this. What a scary situation :(. I will be praying for you all. I can’t believe people are complaining about your post title. Most people tend to ignore mold and this subject should be brought to everyone’s attention. I know I personally never thought much of it before. I’m glad now that we moved out of our last rental because I was sure there was a mold problem even before we moved in, however I never gave it serious thought to our health. Helen, that is such a rude and ignorant comment. Shame on you. So sorry to hear this, Kate. And I do think your post title is pretty accurate. Yes, there are always situations that are worse. But that doesn’t make it any easier to lose not only financially, but also so many things with so many memories. Wishing you God’s blessing as you start this new chapter in your life! I’m soooo sorry to hear this! I went through something similar (not quite as bad) a few years back and everyone thought I was was crazy until I fix the leaking windows (which stopped feeding the mold) and everyone started getting better… But anyway, I highly recommend taking GSE internally for a few months to help your body kill the mold and remove it naturally. It hides well in orange juice. Good luck! If I didn’t know any better, I would think you moved into my childhood home! I am so sorry you had to deal with this aggressive mold. I wouldn’t wish that upon my worst enemy, knowing the nightmare we had to deal with. My childhood home was built in the 1940s on an old swamp runoff. The swamp had dried out, but the moisture and the heavy wet air was all still there, the grass and surrounding ground still had a tendency to be a bit marshy, especially when the rain fell, and the swamp runoff was just an uneven downward slope, so my house, along with many of the other houses on the block, would flood during heavy rain or when the snow melted. Water would seep up through basement floors and that fueled the mold. My house was the oldest house on the block, and was not updated with legal building codes, so we had a bigger mold problem than most, if not all of the other houses. Layers of black mold would be all over the walls, in all the closets, in the shower, etc. My clothes smelled musty all the time, my house smelled like a swamp, and my bedroom and the basement was where the worst of the mold was. In my room I remember it was a daily thing to have to wipe water that would drip down the walls. I was so sick from this, all the time. Every day I’d wake up nauseous with cold and flu-like symptoms and I had to deal with that for over fifteen years. I have wondered if my extreme toxic mold exposure was one of the several factors that weakened my immune system and made me so susceptible to getting a rare auto-immune disease a couple years after I moved out of the house to attend college. Mold is so toxic and many times people have no idea how serious it can be. Thanks for making people more aware of this. Praying things work out for you and your family, and I’m so glad you are out of that situation. Do you have any suggestions for getting rid of the mold in your bodies? In a few weeks I will be posting the detox that we are going through, which will talk about how to get rid of mold. It is hard to start over. NO DOUBT. But you have a great attitude and focus, on, what really matters. Hold on to THAT. We lost our home and possessions not due to mold, but an intense storm which brought so much rain, that the sewers clogged and turned how home into a sewage guyser and flooded every room in over 6″ of raw sewage. That was Friday July 13, 2011. Now in a pretty amazing but very difficult journey, God brought us on this path to answer a prayer. So we now live full time in an RV, homeschool and have a campground ministry to all the other RVers we meet. God answered our prayers just NOT the way we had imagined. Having had to start COMPLETELY over, I’ve been more purposeful and thoughtful about my purchases and things I allow to take up precious space. Even when we own a home again one day……we are all changed for the better……forever!!!! We focus on each other now more than ever, and our relationship with our Savior. I’m always shocked that people always find something to criticize on your blog. I was hoping this one would be different for you and you’d only receive encouragement and compassion. It reminds me in *some ways of Job; He lost all his possessions, family (minus the unsupportive wife), and health, and he STILL had people criticizing him! You seem to be responding to your situation with faith and even some joy, and that is an encouragement to me. So thank you! Praying for you all to continue in joy and grace! I am so sorry this is happening to you. Starting over is refreshing but not this way. I hope things turns out for the best and you don’t lose it all. It breaks my heart to see these stories…but it has been my life for a while now. I started a VERY thorough website for people who are interested in learning more about this awful phenomenon we call “Toxic Mold Exposure”. We are always looking for real stories to post as well as offer helpful advice to those who are effected by mold. I’m so glad that you did the right thing by leaving everything behind. I see so many people who refuse to leave their possessions and end up so chronically ill that they can’t recover. Hi! I’m sorry that you are going through this. We’ve been renting for 3.5 years and are suspicious of the finished basement that has been too damp too often . . . We just got a mold test kit and hope that if there’s anything concerning that it will get caught. So sorry for this large trial in your family that impacts you physically, emotionally as well as financially. I am praying that as you get out you will all heal completely and not have any long term effects. I have read that washing things in ammonia, while not real natural, is one of a very few ways to kill mold spores. Maybe that will enable you to keep your cherished heirloom quilts etc. Could a recovery service scan all your photos and fax them to another location to be put on CD or reprinted so you could keep the memories associated with them. Again sorry for your losses and praying God will bless you with needed healing and provisions. Thank you for this post! My family went through a difficult year of illness and I am going to search my house now. I have been cleaning my fridge more frequently and changing filters in the air conditioners and dehumidifyers more often but I did not think to check the basement for mold. I will be pulling up floor tiles to check today. Also, I always get sick when I start back working each year. I am a teacher and I wonder if there is mold in my school. It’s a scary thought. I feel for your family, but I will give you another reason to be thankful, and that is that you had a place to go, many people don’t, there choice is to move out and be homeless or stay, and do the best they can, many people living in housing projects or subjected to this daily, and many people like myself included, have to rip up what they can, (my son-in law did this as I lay in the the Icu intubated for 4 days), and as you we thought we got it all, and didn’t realize my slow recovery and continual issues, they call it RAD reactive airway disease, when it acts up it’s like a severe asthma attack, I ended up being laid off from work and had to go on disability as I missed so much work there were a couple of months I in the hospital more than I was out, I didn’t know the connection then, but I’m sure of it now after much research, After 2 years I moved and now after several years I’m finally getting better, but the other day the bathroom smelled like mildew, I’m hoping we got it cleaned up sufficiently, as I really have no were else to go. So even though you feel as though you have lost everything be grateful that you can replace it, many people like me can’t. Hope this helps you to have another thing to thankful for. But it was a blessing in disguise! We now live in a way better house for the same price. A much safer town. Awesome landlord. And we have not really been sick since moving in. Except for a hands foot and mouth episode. Ick! I hope it turns out to be a blessing for you also! And hopefully you all feel better soon! Are all amounts and degrees of mold bad? We live in an, and we have mold on the ceiling of our shower and on our windowsills. A year ago our washing machine flooded and caused some mokd that we thought we took care of. My husband has had increased breathing issues and frequent coughing fits in the recent months and my son is congested all the time. Could even small amounts of mold cause a problem? Most mold is bad. Even if it’s not “black mold” or there’s not a lot, people vary in their sensitivity to it. If you are noticing symptoms, then I would assume that there is still mold in your home, and you should call an independent hygienist to come test it. My family is exactly where u were. I am so sick and now I am losing my home, my belonging, everything. It’s sad because we have found very little help! Unless u have gone through it u wouldn’t understand! It’s very lonely!!! So sorry to hear that, Lisa! It is a year later for us and I can say, on the other side now, it is very hard but it is so worth it. I hope you are able to heal quickly and get back to normal. I like that you are sharing your story. It is an important thing that people need to know about be aware of. But to title it the day we lost everything…. I just can’t wrap my head around that. You lost your possessions, and that’s all. My 17 year old daughter was killed in a car accident last year. We lost everything. You are very lucky that you can get new possessions and make those choices and changes together and as a family. But you did not lose everything. Different people have different struggles and situations. It’s silly to compare them. Losing a home, and all your things, is an incredibly difficult place to be. Yes, you can buy more, but it’s a huge financial struggle. And, some of those items have sentimental value and cannot really be replaced. Let’s just not try to decide whose is worse.